This is the big news yesterday in the NBA off season. Accordingly, it was reported by the NBA News Website itself. Here, Manila Bulletin carried it in their front page news. I could just imagine how this news will be treated in China. Yao Ming is the most popular Chinese basketball player ever and perhaps the most celebrated Chinese athlete in terms of worldwide impact and recognition. He is the face of China sports, basketball in particular. His entry to the NBA created a massive popularity of the NBA and basketball in China. In his debut game as a top draft pick of the Houston Rockets in 2002, it was reported that hundreds of millions of Chinese basketball fans watched the game in television in China alone.China pinned down its hopes of barging into the world's basketball elite under his 7'6" tall frame, sweet shooting touch and agility rarely found in such big men. He was consistently voted as the starting center of the West All Star Team, outvoting even the other great big man in his prime days then, Shaquille O'Neal, thanks to his multitude of Chinese voting fans. Remember the words of NBA great now tv commentator Charles Barkley? ("I'll kiss his b--- if he can score in...") Well, Yao Ming scored in double figures and stood on his own against Shaq... Barkley ate his words. Yao's entry to the NBA had been delayed. 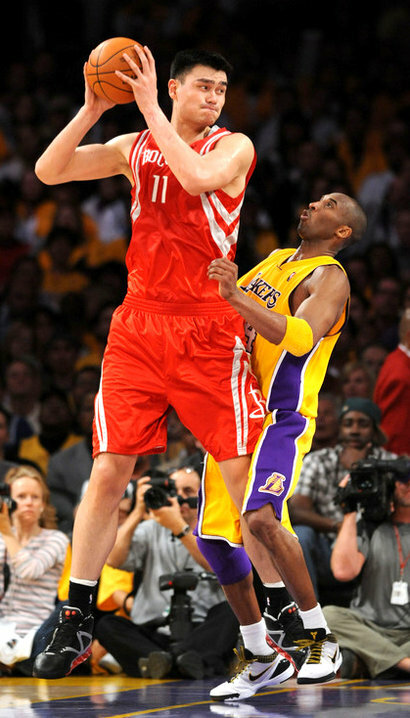 China basketball had been refusing to release him from his local team, the Shanghai Sharks, to the Rockets. It was reported though they finally released him as a show of goodwill as part of China;s efforts to win the right to host the 2008 Summer Olympics. True or not this news maybe, Yao Ming's stint in the NBA far outweigh expectations. These past seasons, Yao has been hobbled by foot injuries. It is unfortunate that he will leave still at the peak of his career. His 5 year USD 76million contract with the rockets has just expired in June. Add to that his numerous endorsement deals and Yao Ming will retire financially comfortable.